“I want to pay more to heat my house this winter,” said no one ever. With energy costs at an all-time high, many homeowners are looking for ways to save on home heating. Before you give up and move closer to the equator, consider some alternative options to save on energy costs this winter. If you’re using electricity to heat your home, you are likely fighting a losing battle. Electricity is expensive and doesn’t deliver a very satisfying warmth. Homeowners are realizing the benefits of alternative sources of heat, and one of the top choices in Eden, NC, is propane. Money savings. It is simply cheaper to heat your home with propane than with electricity. Propane is more efficient, meaning you get more warmth for each dollar you spend with propane. Warmer feel. Propane offers a warmer, more radiant heat than electricity. The heat created when propane burns goes further and lasts longer, making your home feel more consistently comfortable throughout each room. Safety. One of the safest heating fuels, propane burns clean, creates very little soot, and will not ignite except under extremely hot temperatures. Dependability. Even when the power goes out, your propane furnace will continue to heat your home. The same cannot be said for electric heat. Do you currently have a forced air gas or electric furnace? Forced air means there are ducts and vents in your home that the warm air moves through to heat your home. If the ductwork is already in place, that’s half the battle already. You will simply need to replace your old furnace with a propane furnace. You will also need a propane tank installed somewhere on your property either above or underground. A propane supplier and HVAC specialist like Berico can handle the entire process for you and continue to provide you with routine maintenance and propane deliveries as long as you need. If you have electric baseboard heat or wall mounted units that do not require ductwork, you can still switch to propane. It requires just a bit more work to install ducts and vents throughout your home. The extra work to convert does raise the cost, but each individual case is different. For some it may be more affordable than for others. Berico will do a free estimate for you and recommend your best option from a financial standpoint, taking into consideration the cost now and your possible future savings. The electricity myth, that it’s better for the environment, needs to be stopped. In most areas (certainly here in NC) electricity is made from burning coal. When coal burns, harmful elements like sulfur, mercury, lead, and arsenic are released into the air. Clean-burning propane is a much more earth-friendly option for energy. By switching to Eden, NC, propane you are doing your part to preserve our planet for future generations. 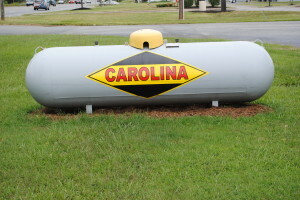 For a free estimate on switching to propane, call Carolina Fuels at (336) 623-9741.